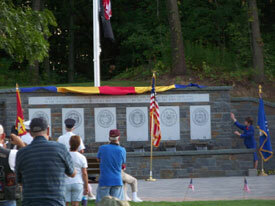 The Town of Colonie Veterans Memorial was formally unveiled to the public on Tuesday, August 25, 2009. (Photos) The memorial, designed by Keith Buff of Einhorn Yaffee Prescott Architecture & Engineering PC was unveiled by Robert A. LaDuke, Colonie Veterans Memorial Committee Chair and Colonie Town Supervisor Paula A. Mahan. 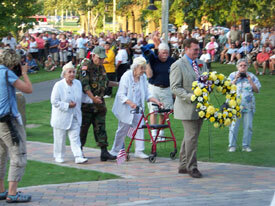 After a rainout on August 21, 2010, the original unveiling date of the memorial, August 25, 2009 proved to be a beautiful day and well over 1,000 residents turned out for the event. Ric Mitchell of B95.5 FM served as Master of Ceremonies and Michelle LaRock, Deputy Director of the New York State Division of Veterans Affairs was the Keynote Speaker. Performances included a patriotic medley by Capitaland Chorus, the LaSalle Institute O’Donovan Drill Team and piper Officer Patrick Germaine of the Colonie Police Department. Taps was performed by Steven Stella of the Fort Crailo Yankee Doodle Band. Following the ceremony was a performance by the Electric City Chorus. The Town of Colonie Veterans Memorial would not have been possible if were not for the hard work by the members of the Town of Colonie Veterans Memorial Committee. Thank you to all members, past and present for your generous contributions in all apects of this worthwhile project.